Have you ever been teaching a history lesson when one of your children pipes up with a question. "Mom, is Carthage a city in Oregon or some other country?" Oh dear, you think to yourself and then calmly explain, "Honey, first of all, Oregon is a state, not a country. And Carthage no longer exists, but I think it was located on the northern tip of Africa across the Mediterranean Sea from Italy." After receiving two or more questions along this vein, you realize that you need some better resources. 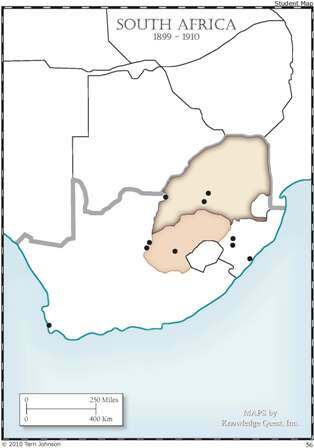 Map Trek is an atlas plus historical outline maps that allow you to teach geography alongside history. This is a resource that any homeschool parent can use with brilliant success, even if you don't remember a thing from your history or geography classes in public school. CDs ARE NOW IN STOCK! 1. A full color teacher's answer map that will help you tremendously. Here are a few samples below from the Modern World portion of the CD. 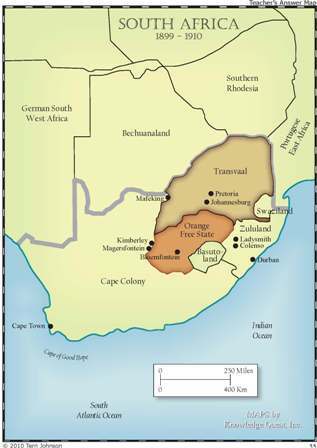 Go ahead and download this map that shows South Africa at the turn of the century. Right click and choose "save image as" to save to your computer. How is Map Trek different from your original Blackline Maps series? 1. Map Trek has more maps - over 350 of them on the CD. 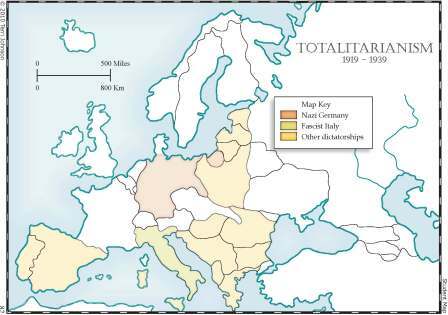 Blackline Maps of World History has 200. 2. There is more detail on the Map Trek maps, because they are intended for use up to 12th grade (Blackline Maps is for students 1-8). 3. 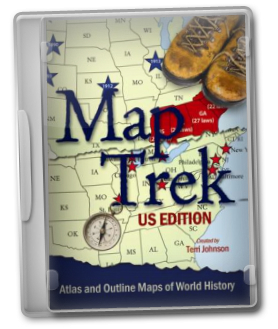 Map Trek has lesson plans for students in grades 1-12, with 3 levels of difficulty. 4. 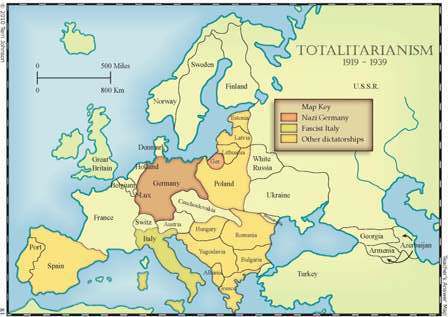 Map Trek has full-color teacher answer maps; student maps are slightly shaded. Blackline Maps are black and white. Here are two more maps for you to download to help you make your decision. Click on the maps to bring up PDFs; then save to your computer. 175 Full-color teacher answer maps. 170 Blank outline maps for the student. For a full list of maps within each of the four sets included on the CD-ROM, please click on the links at the bottom of the page, which will take you to the individual ebook sales pages. 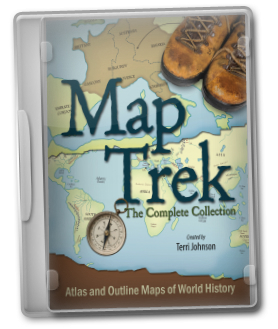 Would you like to download the Map Trek Sampler Pack for free? It is loaded with 32 maps with lesson plans that you can begin using today. Get your free 47 page Sampler Pack when you sign up for our newsletter. Just enter your name and email address in the fields of the newsletter sign-up box in the right-hand sidebar. We promise not to share your information with anyone for any reason.